Is the most coveted issue of the year by every fashionista up and down the country. 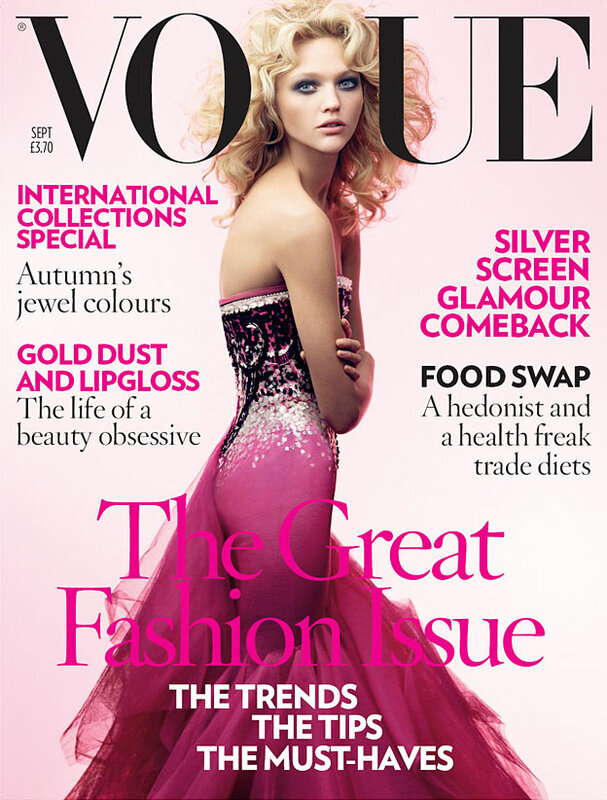 Back in college I may have been known to purchase Vogue instead of dinner – this is most definitely insane and not something I would recommend, but it just shows you how deep my love for Vogue runs – also, remember The September Issue documentary in 2009? When we got to have a peek inside Anna Wintours house? Remember the bookshelf she had of all the issues lined up? Yeah – I do that! Every model worth her salt dreams of being Vogues September issue cover and this year for British Vogue, that honour goes to Cara Delevingne. This woman, it would seem, is unstoppable, just two days ago she was revealed as the face of Topshop for A/W ’14. This is the very first time Topshop has used a solo model for a campaign – which goes to show you the kind of pulling power this lady has cultivated in recent years! Cara joins a long list of September issue ladies for British Vogue including last years Daria Werbowy and former cover girls Karlie Kloss, Karen Elsen, Kate Moss, Sasha Pivovarova and Gisele Bundchen to name a few. 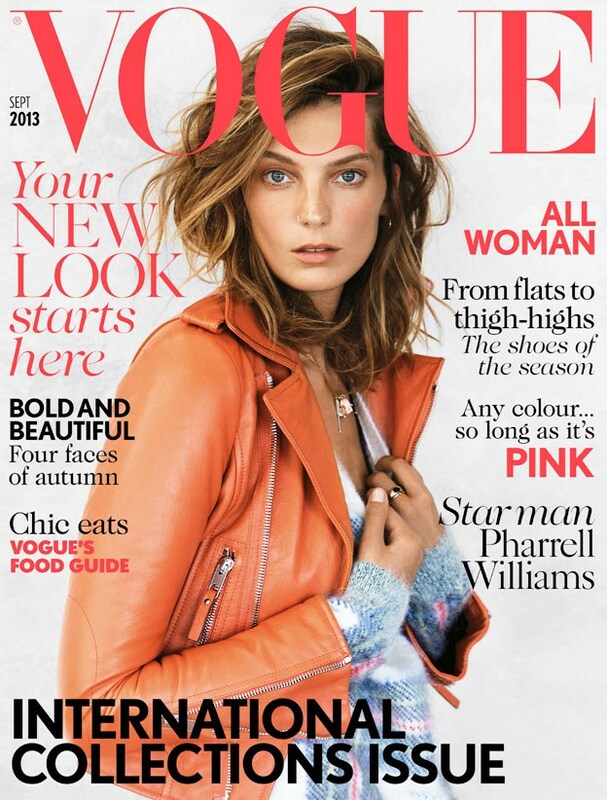 This years September issue is 462 pages long (the largest issue British Vogue has ever produced) and with them promising more photoshoots than ever, all of the A/W ’14 collections and Miss Delevingne in head to toe new-season Louis Vuitton, I for one am counting down the days until I get my hands on this issue and can let the lusting and coveting begin! Next Post Greetings from Portugal! what an honour, she deserves it! i think she’s so gorgeous and talented! I am also amazed at this girl’s pulling power, she really is everywhere and did everything! Just goes to show that being born into a quasi-aristocratic bloodline really goes a long way, esp if you’re pretty too! She’s not tall at all, I met her in real life but she photographs soooo well and is so charismatic to be around, so down to earth! And I love how you don’t buy dinner over vogue, like carrie bradshaw. So glad I clicked on your comment on ATLANTIC PACIFIC’s blog and got led back here to yours. It’s seriously full of GREAT info and juicy pics here! Just followed you on GFC and bloglovin’, be sure to see more of you soon. By the way, you should check out my newest outfit featuring CHRISTIAN DIOR COUTURE EMBROIDERED SNEAKERS by Raf Simons, and of course that ubiquitous CHANEL GRAFFITI BACKPACK!! Guaranteed to provoked you in the best way possible! Thanks a mill for your kind words and for following! I’ll be sure to check out your newest outfit! I love Cara in all her campaigns. She actually boarded in the same room as my little sister when she was at school and was definitely whacky back then too! I always get the feeling from her interviews though that modelling is not what she -really- wants to do. Ha! I’m pretty sure my fella thinks I’m a bit mad too! I’d love to have a full wall of them! I definitely concur with your observation there, I’d say she has Acting as her “end game” rather than modelling! It really will – I can’t wait!! Good ol’, reliable Vogue. You can never go wrong with Vogue.